For decades, Ruth Chew’s classic chapter books full of everyday magic have enchanted early readers. Now that they’re in print again, a new generation can fall under her spell and fall in love with reading. How do you keep a witch out of trouble? A witch is coming to stay with Laura and Sally. But taking care of her won’t be easy—this one is more than a little strange! She’s a very picky eater (only bones and eggshells will do). She makes BIG messes. And after a spell gone wrong, she is stuck living upside down! Can the kids keep this little witch out of mischief and keep her a secret from Mom and Dad? RUTH CHEW was born in Minneapolis and studied at the Corcoran College of Art and Design in Washington, D.C. Working as a fashion artist, she started writing stories about witches for the youngest of her five children. The first of these, The Wednesday Witch, was a big hit, and her new career was born. 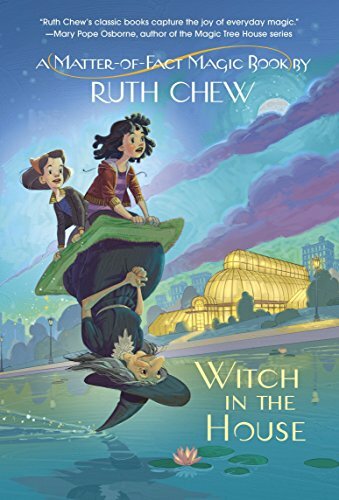 Ruth Chew went on to write twenty-nine tales of magic and fantasy that have enchanted generations of readers.